Had a great time, atmosphere is really chill as they try and get everyone to drink and enjoy the evening together, which is especially nice when you're travelling alone like me. If I ever end up on Gili again I'll be sure to visit! Saubere zimmer, saubere toiletten. Sehr gutes essen und immer was los. Arbeiter sind alle offen und nett. Definitiv ein Partyhostel. So eine Art Mallorca für Australier hier, aber wer Party sucht und Leute kennenlernen will, der ist hier richtig! Hatte eine gute Zeit. Essen und trinken kann man (auch) im Hostel. Es gibt aber keinen Pool und keine Schirme, ist also leer tagsüber aber abends versammeln sich alle zum Vortrinken. One of the best hostels I ever stayed! The staff was always introducing everyone! 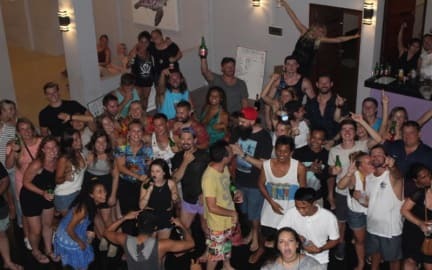 The perfect hostel to meet new people and to party a lot! Loved it! Get ready for party in here! Free shots every night. Awesome staff with lots of exciting drinking games. Also the snorkling trip was unreal. Tequila shots at half time, awesome trip for a good price. Would highly recommend staying here. Facilities are clean and showers are big. Beds are comfortable and AC is working well. So you can relax in the morning before the party starts again. Wifi connection sometimes gets interrupted, but overall working. If you want to get drunk af every night, this is your place. You can‘t really hang out there if you don‘t want to get drunk. The hostel is going every night to the same bar - Jungle, which is actually sad as there are many other cool and better bars around. Staff is really friendly and it‘s nice to just be im a 3 dorm room. Bathroom could be cleaner. Pretty ugly concrete hostel. It’s all about the drinking and after 10, they shut the whole thing down so everybody has to go to some bar with bad music. It seemed more like a place for teens to find a hook up at times. But if you’re into drinking games, this is the place for you!